Guns N Roses, I just can't quit you! Harmonically things are ok. My main issues are 1) the chorus is very busy so hard to insert new stuff and 2) it is difficult to get the vocals to sit right. The original mix is balanced on the head of a pin: somehow Axl is both very quiet and clearly audible. Last edited by Warezio on Sun Jul 09, 2017 6:58 pm, edited 6 times in total. You may do it to all of Ariana's sources, but it depends of how it will be sound. I think of this track like a Disneyland theme park ride: "The Adventures of Ariana Grande in the Jungle!". It's very busy, loaded with high torque transitions, and has a somewhat dark tone; reminiscent of Mr Toad's Wild Ride. well i'm not sure how you know this stuff, but sure enough listening to Axl again in the original he's really soft in the "nose and throat" frequencies, maybe they cut them to have him sit in the pocket, or maybe he just sang that way. so (except for adlibs) i eq-d the vocals, then hit the acapella mix with a compressor and limiter, and then dialed the gain. 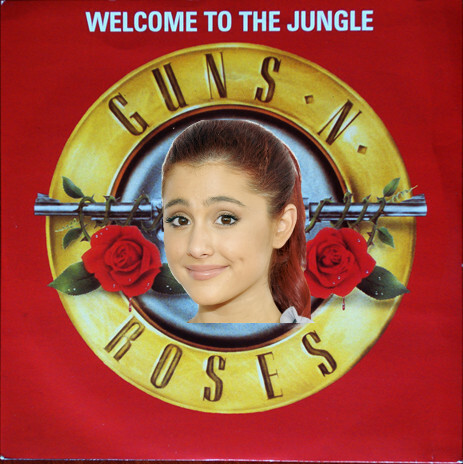 there's headroom for Ariana to get louder, but i held back a little because i wanted to match Axl. You're almost there with the eq of Ariana's voice, but I think it's very much acceptable as it is now, only issue I have is that the Problem acapella sounds a little bit OOT, the whisperings sounds cool tho, but the singing part not that much imho. I loved how you used the powerful Ariana's parts in the transitions, that was awesome! rrodd wrote: You're almost there with the eq of Ariana's voice, but I think it's very much acceptable as it is now, only issue I have is that the Problem acapella sounds a little bit OOT, the whisperings sounds cool tho, but the singing part not that much imho. Yeah. Originally I was hoping that I could get Ariana to break up with Axl in the 3rd chorus, since he has been the worst kind of abusive boyfriend in the song, but I couldn't find the right lyrics; and then I liked the sound of the problem bits so I kept them in. Trippy combo. "The But in this state of mind" syncopation is cool. I highly recommend cutting the Ariana vocals at 3:26, 3:34 and 3:51. You are out of key there. Happy Cat Disco wrote: Trippy combo. "The But in this state of mind" syncopation is cool. I nuked the vocals at 3:26 and 3:34, as also suggested by @rrodd, and that worked well. I kept the vocals at 3:51 even though they are a bit (major/minor ?) clashy because it's only time Ariana comes remotely close to sticking up for herself. This is a cool collection of Grande tracks, ambitiously mashed with another challenging G n’ R track (I’d given up on G n’ R myself, but you’re making me consider retrying!) Highlights for me were the “state of mind” parts and the whispers--both really make this one special. Harmonically it’s not perfect, but it ain’t bad at all. Either way, it’s a lot of fun! MashGyver wrote: If it were my mashup, I would probably go through the tedium of dissecting the original drum track (the one that’s full of Axl), sampling individual kicks, hats, and snares, and that glorious cowbell if possible, and trying to re-create what’s missing instead of transitioning back and forth. Mashups are evergreen artifacts, so I'll invest some time in this and report back on the results. I also swore them off but, just like Ariana, I can't keep away. I'd really like to see the MashGyver treatment of GnR. "Wildest Dreams o' Mine" was a harmonic mess but still got a lot of plays, downloads, Reddit upvotes, etc. which tells me there is an unmet appetite for this kind of destruction out there.